Individual watermelons make me mildly cheerful, so I brought one home from Market Street on Sunday afternoon. It's been a hectic few days, but last evening I halved the melon and made melon balls with my trusty Tupperware utensil. That's as sharp as an object as I should hold during the GOP convention broadcasts. Usually I give a third of a watermelon to my elderly snaggle-toothed neighbor. 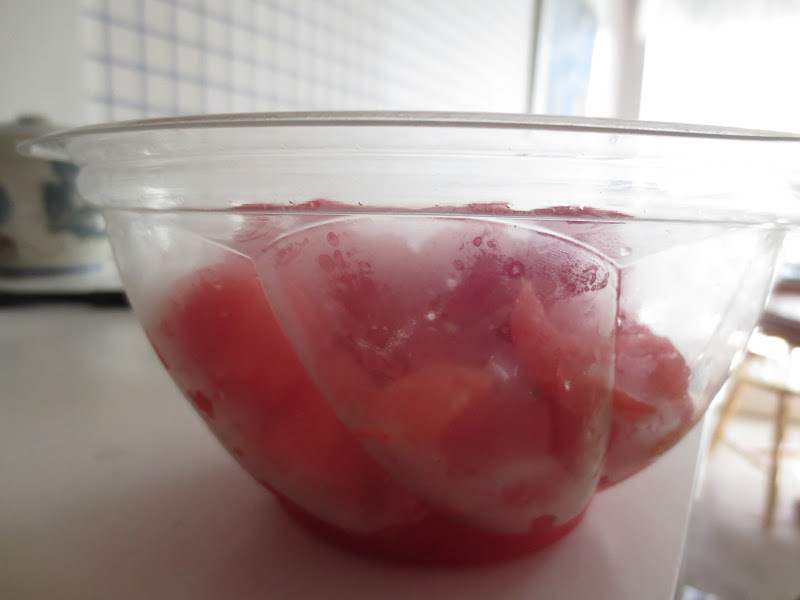 Put a good portion into a covered container for Wild Bill, and lunchbox servings in small Rubbermaid lunch containers. 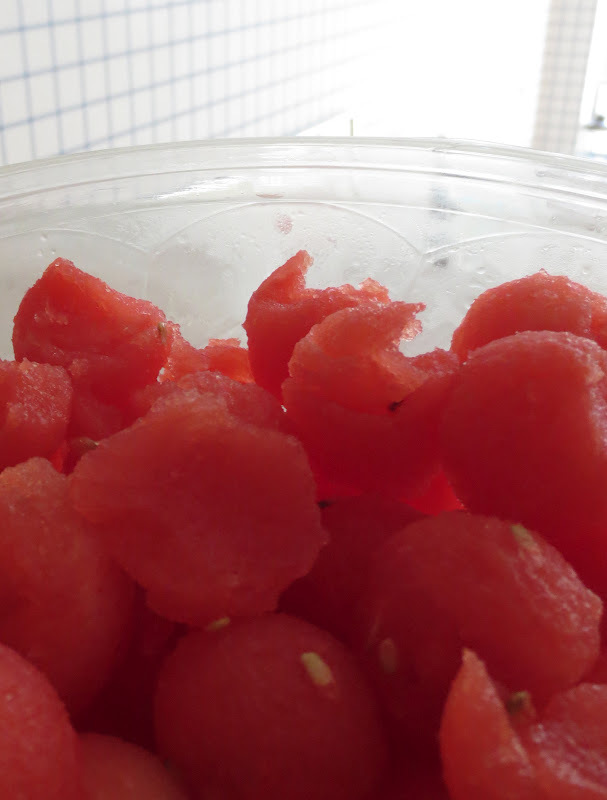 At lunch I very slowly noticed that I wasn't enjoying the watermelon. I tried to ID the problem, and finally figured out there was a chlorine taste to the fruit. If the outside of a melon is washed with chlorinated water, can the taste permeate the inside? Well, you know, it is like almost every other outbreak that I deal with. There are mistakes that are made in production. In this instance, there was not chlorinization (sic) of the water, which is -- you know, frankly, I think under anybody sets of rules, under anybody sets of regulations, those would've been, you know, put out by the FDA. And, in fact, you know, the regulations or the voluntary regulations the FDA has has those in them, and they just chose not to do it. So now I've got a lot of melon balls that I'm not all that anxious to eat. I won't be giving them to my neighbor. Perhaps their best use is as photographer's models. A happier discovery was the 100 Gallons project at UNC-Chapel Hill's Powering A Nation. I found the project through Kelly Izlar's blog post "Smelling the Rain", a delightful, evocative, and informative piece. One hundred gallons is the average amount of water used by each person everyday in the U.S. Check out the wonderful interactive film, and sample some of the journalistic storytelling and intriguing videos. Eventually I'll sample some of the more scientific sections at the site. Ew. So if we don't chlorinate, we get listeria, and, if we do chlorinate, it tastes bad. Sigh. Pretty pictures. That's the world now.